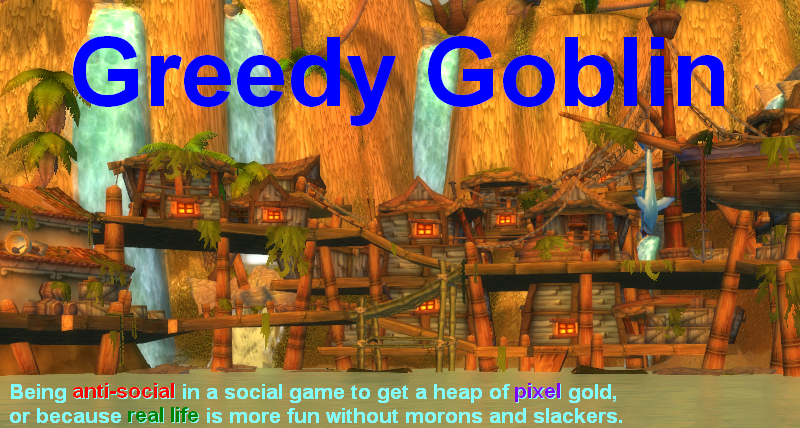 Greedy goblin: They can't be THAT dumb! They can't be THAT dumb! Let's ignore the obvious outcome: the "Black Fleet" will get their butts kicked. This is obvious because if Goons could safely project their power to other regions, they would still have them. But let's assume that they are capable of defeating the inhabitants. What they forget is their own doing, the document of shame with entosis and greatly increased anom count. These mean that no one really need all that space, as proven by them ratting like crazy in a condensed space. The thing is that everyone else can do the same and condense, simply packing and moving to the other side of the universe. Instead of having new money or content, the Goons will get empty "buffer regions" where no one claims sov and no industrialists or ratters live to shoot. Even worse, the abandoned stations will serve as pirate hives for groups that move to these regions for the very purpose to hunt Goons. Nothing serious of course, no one sane would store huge assets in these "staging systems", but they are good to place a medical clone, few JF haul of T3 dessies and go out to have fun. Since the Goons don't intend to own sov or live there, the systems will have no ADM, so the pirates will need just as much effort capturing the stations as Goons had. But above all: why am I 100% sure that this plan is pants on head retarded? 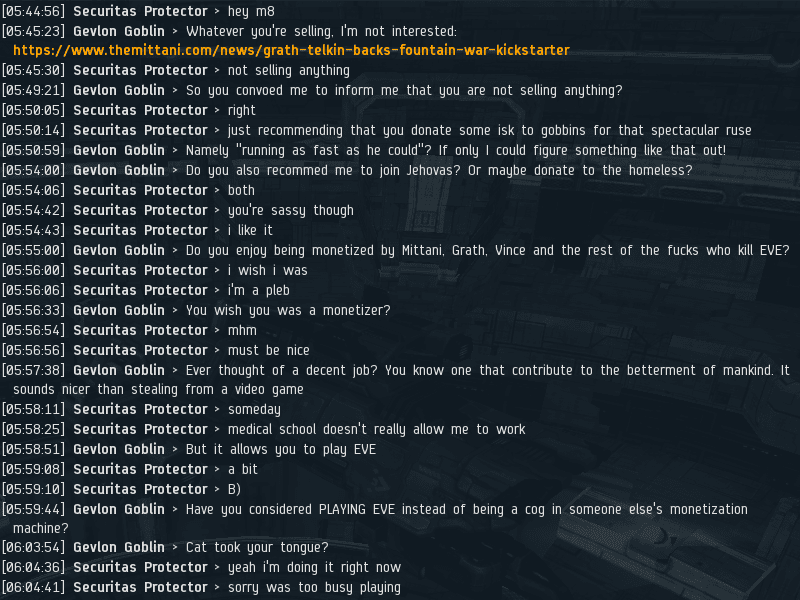 Because the Goons themselves offer better options both to players and corps. If you are OK to bend a knee to The Mittani, you are much better off in Karmafleet or in Section 8 (or Bastion, or FCON) than by paying to a viceroy. That way you can become blue, the tax is lower and you/your people can think of yourself as proud soldiers instead of pitiful slaves. So anyone who could be forced into paying is already in, or soon will be in the Emporium. Finally, comparing this to mafia protection rackets is wrong, because the Mafia does offer something useful: protection from another mafias. No one else is allowed to take protection rackets in their turf and if anyone tries, he gets a mafia war. Goons on the other hand are unwilling and unable to protect their serfs from other protection racketeers. So if anyone pay Goons to be left alone can expect PL, Snuff and local pirates show up too and demand the same payment. Since no one can pay all, he must pay none! Hahahaha, Securitas Protector in med school? That's a malpractice lawsuit just waiting to happen. The Viceroyalty thing is just a logical extension of the Mining Permit promoted by high sec gankers. I always find it funny that you call things stupid that you are too dumb to understand. If you actually understood how the new entosis mechanic affected SOV you would understand that this makes perfect sense and is something that has been in use many times throughout history. With entosis, it is much easier to project power into a region than it is to maintain power in that region. Maintaining control over a region requires lots of effort and never ending vigilance. Projecting power into a region to destroy SOV ownership is easy and requires just a short dedicated campaign. That is why MOA was able to disrupt Goon SOV early on. This tactic has been used many times in the real world under conditions where it is easier to upset the apple cart than it is to keep order and protect the apple cart. The Mafia used to do it all of the time. Powerful lords used to do it to less powerful landowners in medieval times. If people want to own SOV they will pay. So it is a win-win for the Goons. They either make money or they receive easy content. As for you assertion that it would create uncontrolled regions that will inhabited by pirates who will then use those areas to attack Goons, how is that any different than what the Goons face right now with neutral systems? Any pirate who wants to locate close to the Goons and use guerilla warfare to attack them already can. What you seem to miss that everyone else can do it, not just Goons. Anyone who pays Goons will have to pay PL, Snuff and everyone else. So no one will pay. The "easy content" will be entosising uncontested and then go home. The locals will either rebuild or not, but they'd be crazy to give Goons any resemblance of fight. The difference is that currently pirates are sharing space with neutrals. MoA regularly loses more to non-Imperium than Imperium. With that depopulation, they'll have only Imperium to shoot. If things play out as you say, the depopulation will be bad enough for the game to push CCP into creating some sort of meaningful conflict driver (i.e. content to keep goons happy). Goons (and especially SMA) are still struggling to capture Cloud Ring (http://evemaps.dotlan.net/map/Cloud_Ring#sov). Taking sov is not so easy and fast. Goons are still learning it the hard way, doing enormous mistakes: http://1.1.1.1/bmi/isilhin.free.fr/illustrations/eve/entho.jpg. I doubt that The Imperium could entertain war campaigns all over new Eden with Fozzie sov. Their members will just refuse to go as it is actually the case with SMA. "This is obvious because if Goons could safely project their power to other regions, they would still have them." That's not really accurate. Holding a region is different from what they are doing. The idea here is to just cause more damage than the fee they request from the owners of the space. That can easily be done from a distance. Taking and defending that much space though would be impossible. "If you are OK to bend a knee to The Mittani, you are much better off in Karmafleet or in Section 8 (or Bastion, or FCON) than by paying to a viceroy." This is also a good thing for goons, as if they are in the imperium they will pay taxes and provide manpower. Have to agree with S Riojas: this is just Code Monkeys in Null. In your fantasy world Goons will depopulate nulsec, which given how many people willingly sign up to be renters, presently, means that scenario is unlikely to ever happen. Moons, cap and supercap production, and access to BPCs of the big toys Citadels when they come out, defending 'their own' space, is a lot more appealing than just being a sheep and renting. If they can hold onto their space great, Goons get income and a secure border. If not, there are others willing to try. If they 'rebel,' Goons get content. Someone will pay the Danegeld, someone always does. They will only depopulate the nearby regions. Cloud ring, Fountain. I doubt if they'd try to attack XIX/XWX on the east. If they try to go further, they get their asses kicked. I don't think the Viceroyalty thing is Goon stupidity. It is a scheme to manufacture casus belli and generate conflict content. No one is going to move out because Goons are trying to extort them. It is too much effort and if they were worried about Goon they wouldn't have set up their in the first place. As the game does not require any commitment to any loyalties from its players, because of the anonymous alts, it is more likely that most casual players will go over their business while keeping a few alts in Goonistan to make money. The goons shareholders will continue to benefit from a slowly growing pool of pilots, they will keep in check any concerted efforts to destroy them, and will never disappear as there will be no economical advantage for insiders to upset the cash cow. If the game forces true loyalties to be exposed for each player, by linking all alts of the same player publicly by a simple change of EULA, players will then be forced to adhere to one narrative or the other and will only be allowed to keep their eggs in multiple baskets by risking losing access to their accounts.